Toga Limited provides a US corporate address on their website in the state of Nevada. Further research reveals this address actually belongs to Regus, a virtual office service provider. Despite being incorporated in Nevada, Toga Limited appears to only exist in the US as a shell company. That said Toga Limited is registered with the SEC as “Toga Ltd”, so the company does have some roots state side – even if only on paper. Toga Limited identify Michael Toh Kok Soon as founder and President of the company. Michael Toh has years’ experiences in business and market development. He has founded Gen Five Global, a telecommunication company that has been authorized to be Celcom merchants which has 14 branches throughout Malaysia. As far as I can tell, Soon doesn’t have an MLM history. In Toga Limited’s last 10-K annual report, filed all the way back in July 31st, 2017, the company provides a corporate address in Kuala Lumpur, Malaysia. On November 29, 2018, Toga Limited, a Nevada corporation (the “Company”) entered into a Subscription Agreement (the “Subscription Agreement”) whereby the Company will issue 4,704,763 shares of its common stock at $0.85 per share in exchange for ownership of approximately 30,075 square feet of space in an office building known as the Empire Damansara, located in the township of Damansara Perdana, which is part of the Golden Triangle of Petaling Jaya, adjacent to Kuala Lumpur in Malaysia. Toga Limited appears to be a Malaysian company, run by Malaysians from within Malaysia itself. 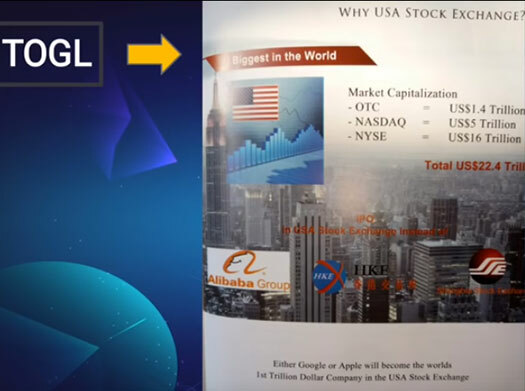 The Company incorporated a wholly-owned subsidiary, TOGL Technologies SDN. BHD. in Malaysia on September 26, 2017. The US shell company was set up in 2016, via purchase of a failed online clothing retailer. On June 30, 2016, Blink Couture, Inc. entered into a merger agreement with its wholly owned subsidiary, Toga Limited (the “Company”), a Delaware corporation with no material operations. Blink Couture, Inc. was originally incorporated as Fashionfreakz International Inc. on October 23, 2003, under the laws of the State of Delaware. On December 2, 2005, Fashionfreakz International Inc. changed its name to Blink Couture Inc.
Until March 4, 2008, the Company’s principal business was the online retail marketing of trendy clothing and accessories produced by independent designers. On March 4, 2008, the Company discontinued its prior business and changed its business plan. 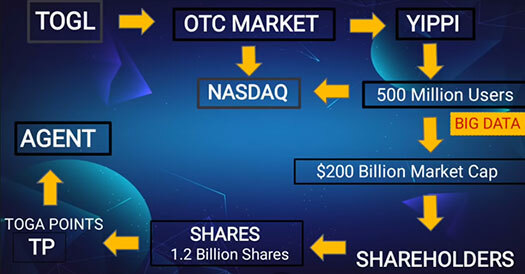 The Company’s business plan now consists of exploring potential targets for a business combination through the purchase of assets, share purchase or exchange, merger or similar type of transaction. Read on for a full review of the Toga Limited MLM opportunity. Toga Limited has no retailable products or services, with affiliates only able to market Toga Limited affiliate membership itself. Toga Limited affiliate membership provides access to a series of clone platforms of existing services. In their own marketing material, Toga Limited openly compares their “me too” platforms to Facebook, WhatsApp and WeChat. We are entering a new era of BIG DATA. Social media platform like Facebook, WhatsApp and WeChat; We have developed Yippi, Togago, Games, sticker shop, Eostre Wave, Languages and others. None of Toga Limited’s “me too” services have anything to do with their MLM business opportunity. TC points have no value outside of Toga Limited. Affiliates can cash out their TC points through “Toga Exchange”, an internal exchange run by Toga Limited. Toga Limited do not disclose the current TC value on the company or Toga Exchange websites. With respect to their compensation plan, Toga Limited pays its affiliates to recruit new investors. There are five affiliate ranks within the Toga Limited compensation plan. Toga Limited affiliates are paid a 50% commission on funds invested by personally recruited affiliates. Note that recruitment commissions are paid in TC points. Toga Limited pays residual commissions via a binary compensation structure. At the end of each day Toga Limited tallies up new investment volume on both sides of the binary team. Residual commissions are paid out as a percentage of funds matched on both sides. How much of a percentage a Toga Limited affiliate earns in residual commissions is determined by how much they’ve invested. Toga Limited pays 75% of earned residual commissions out in TC points. The remaining 25% is paid in app currency. Sapphire and higher ranked Toga Limited affiliates qualify for the Leadership Bonus. The specifics of the Leadership Bonus aren’t clarified the Toga Limited compensation plan referenced for this review. I’d assume though that the Leadership Bonus percentage is in some way tied to downline investment volume. 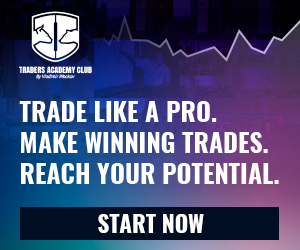 Toga Limited affiliate membership is tied to a $100 to $100,000 investment. Toga Limited’s business model sees real money invested but only worthless TC points come out the other end. In the wake of Toga Limited’s current business model, “Toga Options” as it was known has been abandoned. Since launching its new TC points investment opportunity, Toga Limited has failed to file annual reports with the SEC. Toga Limited’s last annual 10-K report was filed back in November 2017. The last quarterly report was filed in July 2018. According to the quarterly report, Toga Limited lost $3.2 million dollars during the nine months prior to April 2018. The Company, has not generated minimal revenues, has incurred net losses, and has accumulated deficit. These conditions, among others, raise substantial doubt about the Company’s ability to continue as a going concern. There is no mention of the TC points investment scheme in the filing. On October 30th 2018 Toga Limited informed the SEC it would not be able to file its 2017-2018 annual 10-K report on time. The Form 10-K for the fiscal period ended July 31, 2018, will not be submitted by the deadline due to a situation where the workload exceeds available personnel. The Registrant was unable to complete analysis of all financial and non-financial information needed to be included in the report. This was followed up by an 8-K filing on December 10th, 2018, in which Toga Limited advised the SEC it had dismissed its independent accounting auditor. Since June 22, 2017, MaloneBailey, LLP (“MB”) has been the independent registered public accounting firm of Toga Limited (the “Company”). On December 10, 2018, the Board of Directors of Toga Limited (the “Company”), approved the dismissal of MB as the Company’s independent registered public accounting firm. On December 10, 2018, the Company engaged Pinnacle Accountancy Group with offices located in Farmington, Utah (“Pinnacle”), as the Company’s independent accountant to audit the Company’s consolidated financial statements and to perform reviews of interim financial statements. I’m going to go out on a limb here and suggest it’s not a coincidence that Toga Limited’s new business model coincides with delayed SEC filings. 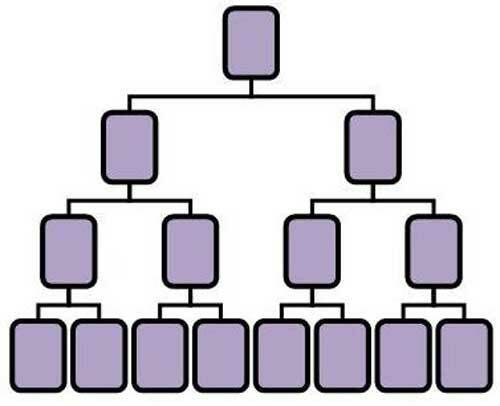 Put simply, Toga Limited’s current MLM business opportunity a passive investment opportunity with pyramid recruitment. This brings with it certain requirements, such as disclosing to the SEC that the company is operating a passive investment opportunity. 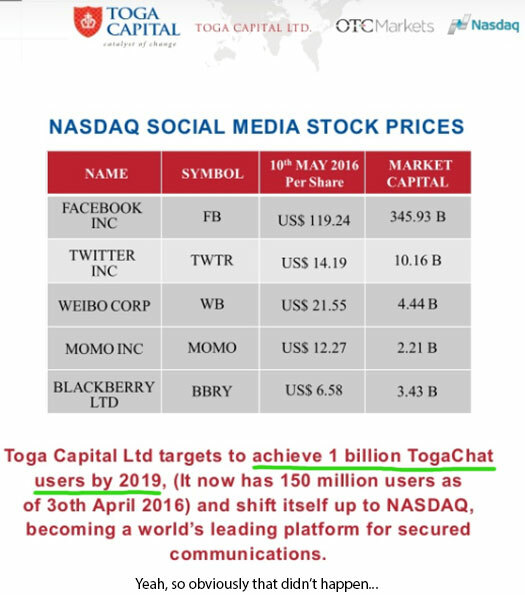 As I understand it the ruse behind Toga Limited’s returns is the sale of “big data” to undisclosed parties. The data is supposedly harvested from Toga Limited’s various “me too” apps. All of this should have been disclosed in SEC filings by now, but as of yet hasn’t been. Instead the one party that could verify Toga Limited is doing what they say they are, has been dismissed. What Pinnacle Accountancy Group come up with remains to be seen. In the meantime Toga Limited’s current MLM opportunity is clearly an unregistered security. The game-plan seems to sucker Asian investors out of their money, by wooing them with Toga Limited’s US shell incorporation. The Company’s current business activity does not at this time provide positive cash flow, although the Company has commenced generating revenue for the first time during the most recent quarter. By avoiding marketing Toga Limited within the US, the company likely hopes to avoid regulatory scrutiny. Fortunately that’s not how securities regulation works. The question that immediately presents itself is whether the SEC will be able to pursue the matter beyond an administrative level. Malaysian authorities aren’t known for taking swift action against MLM companies committing securities fraud. Toga Capital (as it was known in Malaysia), was added to the Bank of Malaysia’s list of companies that are not authorized to do business in August 2017. Nothing further seems to have come of the listing, other than Toga Capital’s Malaysian website disappearing (now it’s Toga Limited). 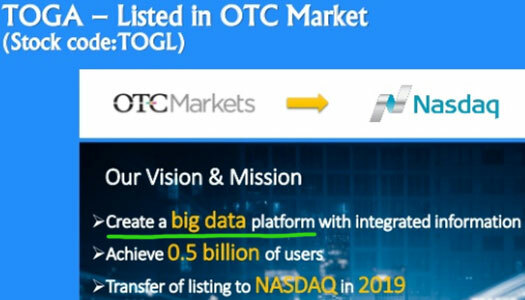 Back in the US Toga Limited appears to already be on the SEC’s radar. Whether anything more comes of that however remains to be seen. The alternative to further SEC action is Toga Limited collapses when new investment dries up. As previously stated, TC points are worthless outside of the company. Whatever value Toga Limited assigns TC points in their internal exchange is made-up. Affiliates will be able to cash out TC points via the internal exchange for as long as there’s new money to pay out (either held by Toga Limited or directly from new affiliates). The Ponzi points exit-scam will probably see Toga Limited tout an altcoin ICO at some point. TogaCoin is out, because someone already beat them to the punch. Whatever it’s called, Toga Limited will eventually get it listed on some dodgy cryptocurrency exchange. Toga Limited management then do a runner with what’s left, leaving affiliate investors scrambling to scam each other through “race to the bottom” trading. Regardless of whether Toga Limited is shut down or organically collapses, Ponzi math guarantees that the majority of investors will lose money.